Owners of the BlackBerry PlayBook, we have some very exciting news for you today - your tablets are about to get treated to a trio of apps that surely nobody will pass on. Honestly, we were expecting to see them running on RIM's tablet on the day of its very release, but you know what they say – better late than never. So which applications are we talking about exactly? Well, keep on reading to find out. 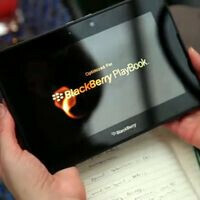 Yes, BBM now runs on the PlayBook too. Turns out that the application has been there all along, we were simply not allowed to use it yet. BlackBerry Messenger is now fully functional thanks to today's BlackBerry Bridge update to version 1.0.0.83. Unfortunately, that means you are still stuck with using the messenger through a BlackBerry smartphone instead of running it independently on the tablet itself. For now it seems like the update is only compatible with BlackBerry OS 6, but an OS 5 version should not be too far off. But why limit yourself to texting through BBM when you can turn a dialog into a full-fledged video call? Now you can with the BlackBerry PlayBook Video Chat application. All you need is a Wi-Fi network, which is connected to the internet, and a buddy to talk with. Oh, we should also mention that it only seems to work between PlayBooks for now. The application features a friends list where you can store your contacts as long as you know their BBID email address. You will be able to check out BlackBerry PlayBook Video Chat as soon as it is made available tomorrow so keep an eye for an OTA update notification. What is a mobile device without a Facebook application these days? RIM has just announced today that a new social network client – Facebook for BlackBerry PlayBook, will be made available for download this month, and that a sneak preview of it will be given this week at BlackBerry World 2011. The application will be optimized for the tablet's 7-inch display and will also take advantage of its HDMI connectivity so that photos and videos can be easily viewed on an HDTV. Users will be able to search for and to add friends, to tag and to “like” photos and comments, to use Facebook's chat feature – just like on a desktop computer. All good things come to those who wait. In this case, we really didn't have to wait long. I am so pleased to see that RIM is making an effort to keep things moving with the PB. Now I just need to connect to wifi and see if the updates are ready!